Garage door maintenance should cover not only the springs and opener, but all hardware parts, panels and electronic accessories to be effective and to produce lasting results. All parts of the system should be examined for wearing and damage. If the coils of the spring are chipped and/or deformed, it should be replaced. The good news is that such issues rarely occur. The cables need a check for fraying and minor cuts. It is important to look at them closely from top to bottom as the damage can be practically anywhere. If any of the described problems is present, the cables require changing before they break. The drums and bearings require inspection for chips, dents, wearing and loosening. 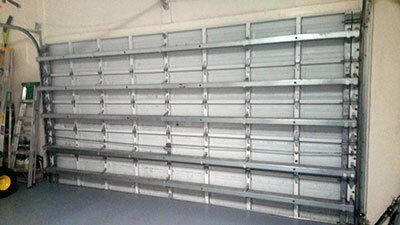 In some cases, adjustment and repair can resolve the problem completely. In others, the affected component should be changed. When the opener is installed, its closing force is adjusted to match the weight of the door. However, with time, the door’s weight changes. It usually fluctuates seasonally with the unit getting heavier in the winter and lighter during the summer. That is why the force should be tested as part of proper garage door maintenance. The first step involves opening the door and placing an object which doesn’t block the safety sensors underneath it. This could be a wood plank. The next step is simply pushing the button of the remote to initiate door closing. If the force is optimal, the door will gently touch the object and reverse. If it is higher, the door will hit the object. In this case, the force has to be reduced. There is a knob or screw at the back of the motor unit for adjusting it.